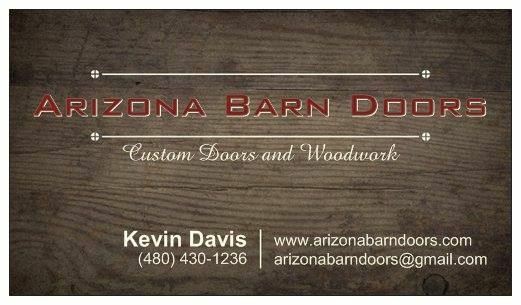 Arizona Barn Doors, a family owned and operated company, located in Phoenix, Arizona, creates custom made sliding barn doors and custom woodwork. With a passion for detail and artistic creation, our barn doors, custom wood furniture and walls, stand out in your home or business. Arizona Barn Doors offers our residential and commercial customers a variety of wood, and hardware to choose from. Our talented team customizes sliding barn doors, wood walls, and custom furniture, to add aesthetic value and functionality to a space. Barn doors, originally made for the entrance/exit of a barn, are more than that today. They can be used to separate rooms, add a custom design element, enhance an outdoor area, and offer space saving solutions for your home or business. There are many styles to of barn doors to please your style, from rustic to contemporary. Arizona Barn Doors works with each customer to design and build the barn door or custom wood piece specific to their style and needs. Contact us today for a complimentary quote.